Welcome to our new laundry room! 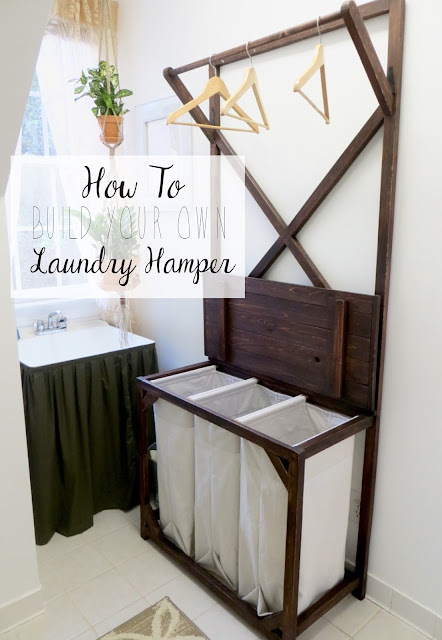 I’ve been working on making our laundry room a happier place to be (because I’m in there a lot) and it all started with me getting frustrated with our previous laundry sorter. It was flimsy, the separator bins would always fall off when you took clothes out, the caster wheels kept coming off and the lid was scratching our wall. I thought for a few weeks about a design and came up with something I’m very pleased with! 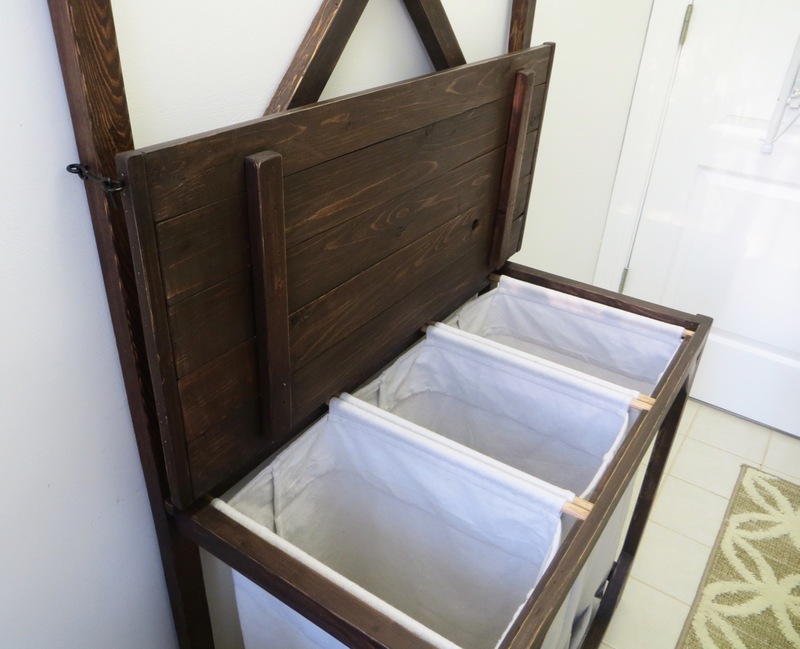 There are 3 large canvas sorters – big enough for our family of 6! The dowels come off easily if you need to wash the fabric bin. The dowels in back are placed inside a hole and the dowel is wedged into the front inside little valleys. A large lid that folds down and creates a workplace for folding (or hiding all your dirty clothes)! 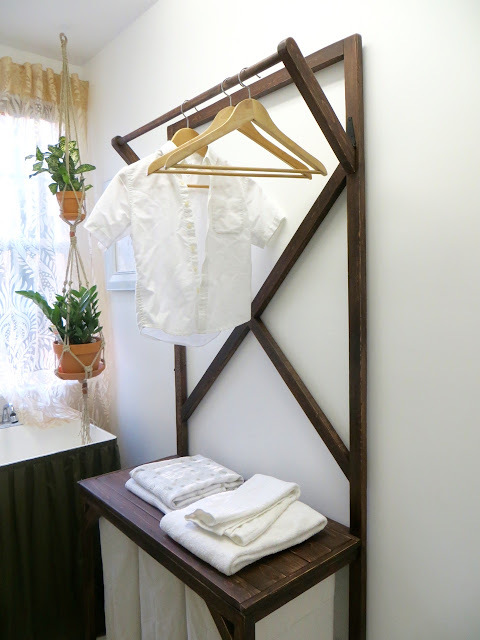 A rod at the top for hanging clothes to dry or prevent wrinkles as they come out of dryer. The rod can also fold up out of the way if you prefer. 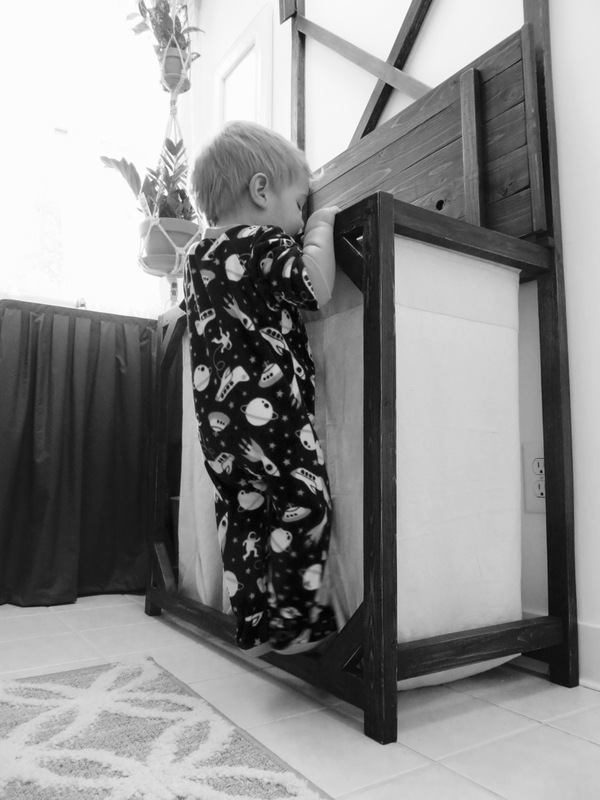 I made sure it would be durable for climbing kids (he did this on his own)! Did I mention the bins are large enough for a child to play in? 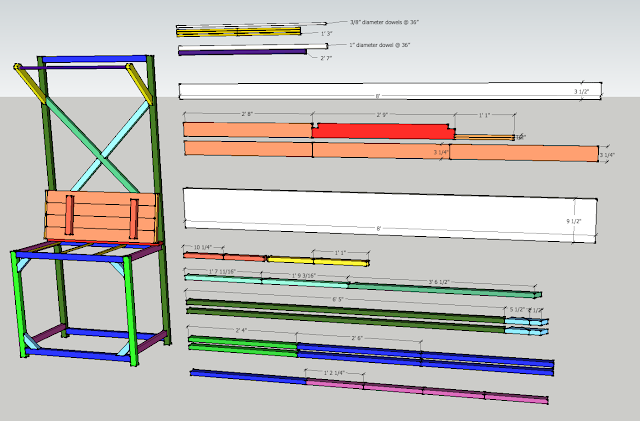 Overall dimensions: 6’5″ tall, 2’9″ deep and 1’4-1/4″ deep. 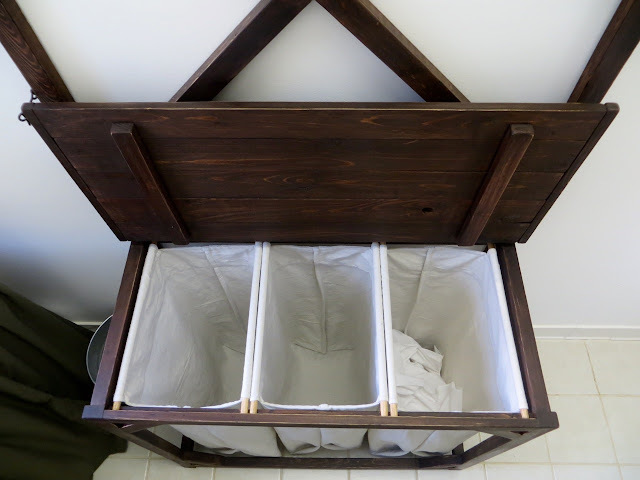 You don’t need to be particularly skilled with woodworking to make this hamper! 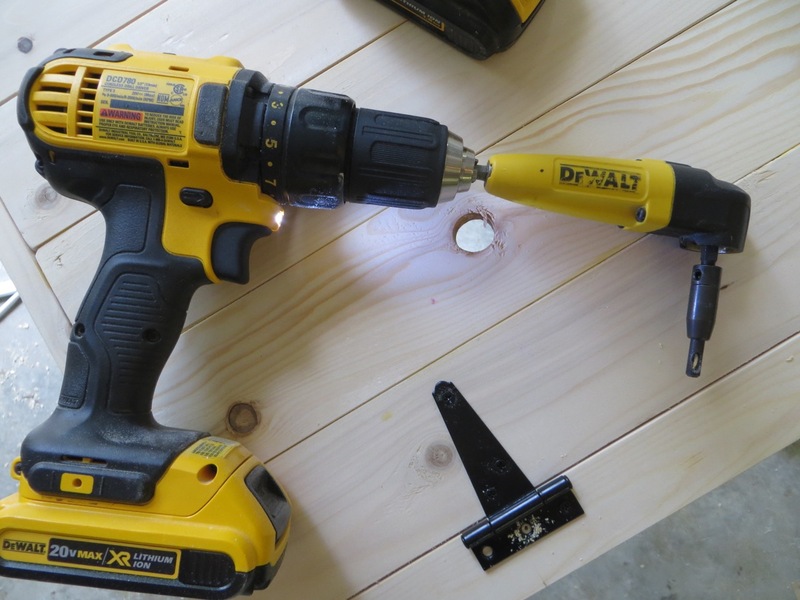 You’ll be ripping down a 2×10 board to make most of the components and using screws to join the main frame and glue+trim nailer for the lid. You’ll be sinking the screws under the surface and glue a wooden plug in to hide screws. 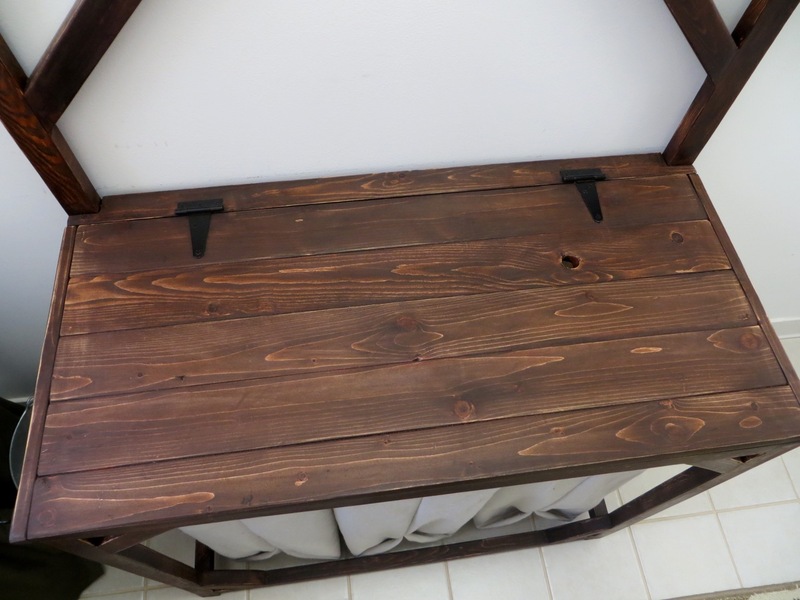 Read over the supplies and tools needed to see if this is a project for you! 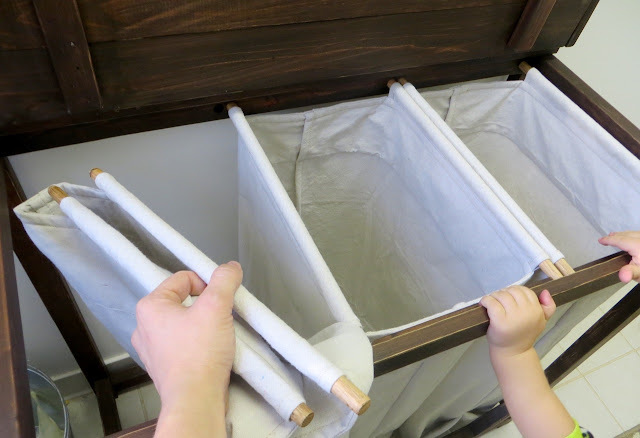 There is also a little sewing involved to make the fabric bins – if you are not a seamstress you can always try and give it a go or ask a family member of friend to help you out! 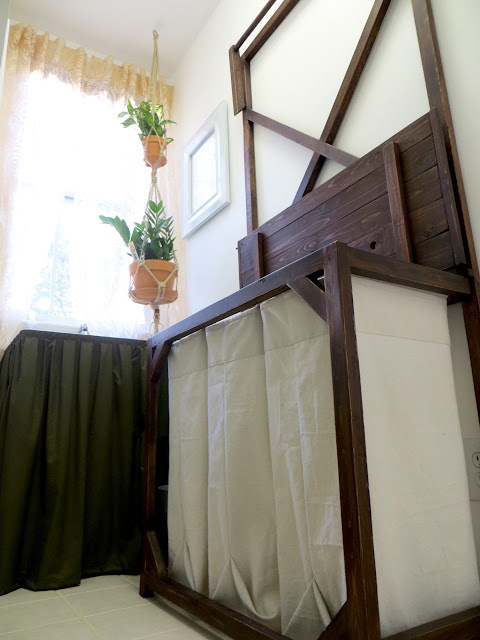 COST: I estimate for the lumber, hinges, plugs, screws & drop cloth the cost comes to around $50 for this project. GENERAL: Please read through this post before you get started so you feel comfortable with each step. Work safely, wearing protective eyewear and ask for help if you need it! Have fun! This diagram shows you how I cut the wood from each board – You can see the 2x10x8 is green and is cut into strips for most of your components. 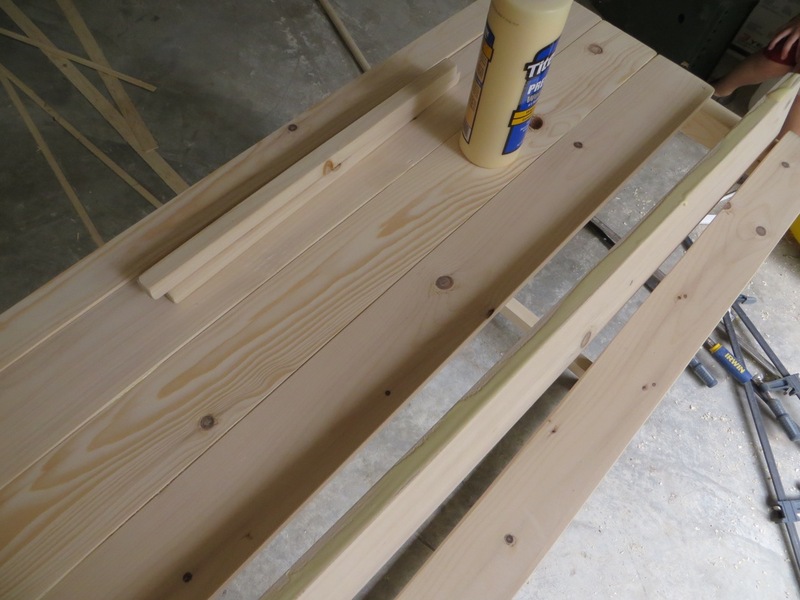 The 1x4x8 furring strips are yellow and the other smaller pieces at the top are the dowels. Here’s a breakdown of the components with color so you can see where each board is placed for building the hamper (the white indicates the original board). 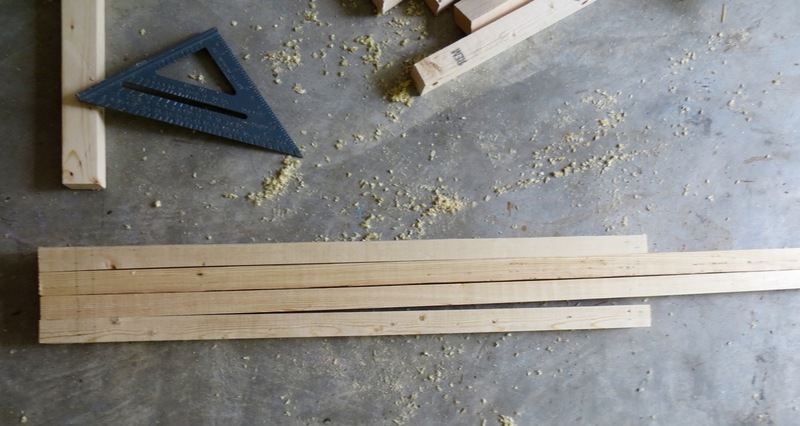 The very first thing you’ll do is clean up the edges of your furring strips by trimming off about 1/8″ on each edge to a finished measurement of 3-1/4″. Next you’ll rip down one side of your 2×10 to clean it up and from that edge you’ll cut 1″ strips off for a total of 7 strips. It’s taken me about a week to write up this post because I’ve been fretting about making this project seem harder than it really is or confusing someone with too many instructions… please read note and study diagram below. 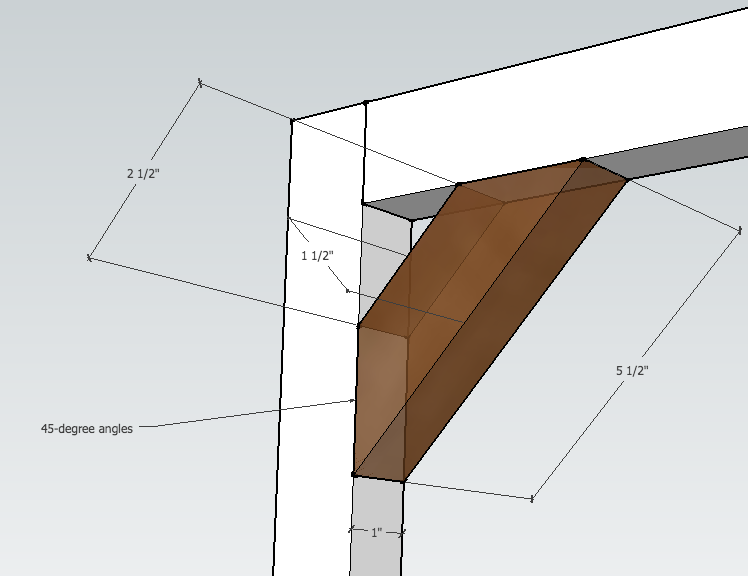 If you understand the orientation of the components in this project it will be much easier for you to cut /build and a lot less worry and stress for me to try and explain how you should orient your boards when cutting your angles in the next steps. 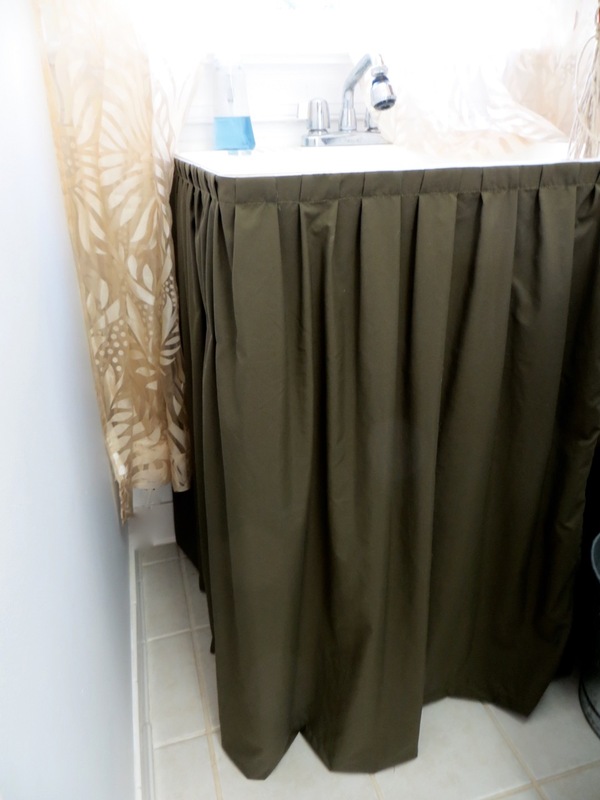 Since we’re dealing with 1 x 1-1/2″ strips it’s important for you to know that almost every component is oriented with the 1″ being the depth if you’re looking at the hamper from the front (the front and back panels). 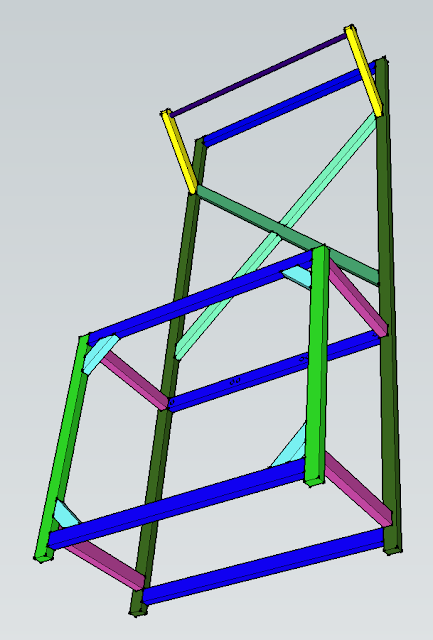 The side stretchers and clothes rod braces are the only components that are oriented differently.. they’re simply flipped so that if you’re standing on either side of the hamper, their depths would be 1″ also. The lid is cut from different boards all together.. don’t worry about that right now. I don’t like cutting lists because if you get your cuts off for any of your pieces, everything else will be thrown off. Luckily with this project there are only a few board that are important to cut exactly right and should be saved until the end… they have (***) in front below. First we’ll be drilling our holes for the hamper rods out of two of the front/back stretchers. We’ll be marking/drilling on the 1-1/2″ side of these boards. With boards flat on the ground measure from the left side over for each mark. Mark @ 5/8″, 9-5/8″, 10-1/2″, 19-1/2″, 20-3/8″ and 29-3/8″. I marked on one board and used a square to transfer the line across both. Mark the center of each line for drilling. Use a 1/2″ forstner bit and drill your holes about 1/2″ deep (for me, this meant stopping at the edge of the bit). TIP: the holes will be slightly larger than your dowels – this is so you can pull them out easily if needed. Next we need to cut a channel in one of the boards to allow the rods to be pulled out. Basically, you’ll be taking off 1/4 or your board to expose the top-half of your holes. Set your board up against your table saw blade and adjust the blade so the top tooth is centered with one of your holes (2nd picture on right). 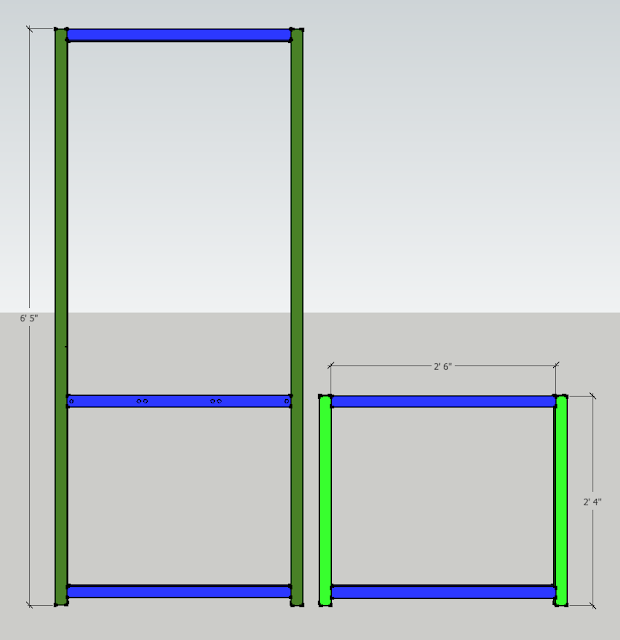 That gives you the height you need – now adjust your fence so you’ll be cutting 1/2″ off from the side with the holes-inward (3rd picture on left). Next set your blade to the height of your first cut (3rd picture on right) and adjust the fence so it’s cutting 3/4″ off. 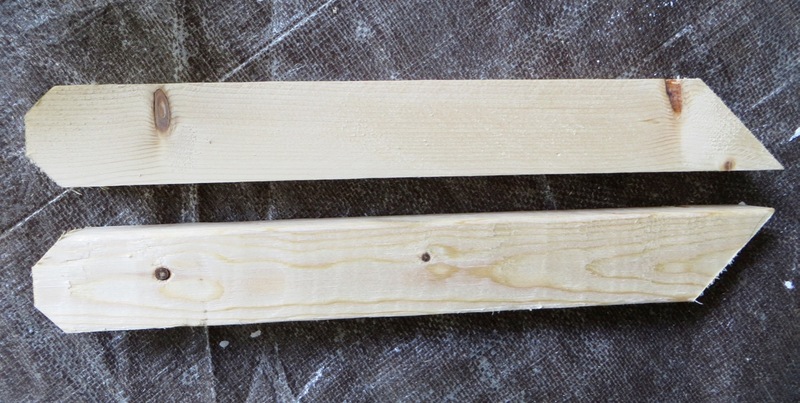 The last picture shows how the dowel sits. It’s best to sand all the pieces you have cut now to at least 150 grit before your build. You can do a final sanding of 180 once the project is assembled. Next we’ll be building the framework for the back and front panels! For this you’ll need your 2 front and 2 back legs and all 5 front/back stretchers. You’ll be screwing the frames together with your 2″ wood screws, so we’ll be drilling from the sides. This picture shows all 4 of my legs with the side facing up (the 1″ side). I lined all of my boards up at the bottom edges and marked where to drill across all 4 with a square to make it easier. From the bottom I wanted my stretchers to be 1-1/2″ from the ground so I had to place my marks between where my 1-1/2″ stretcher would be… say.. about 1-3/4″ from the bottom of the legs for the first screw and 2″ from the bottom for the second (you can hold your stretcher up to see how much space you have to put your screws). I staggered my screws a little… I’ll get to that in a second. Remember that groove we took out of the front stretcher? 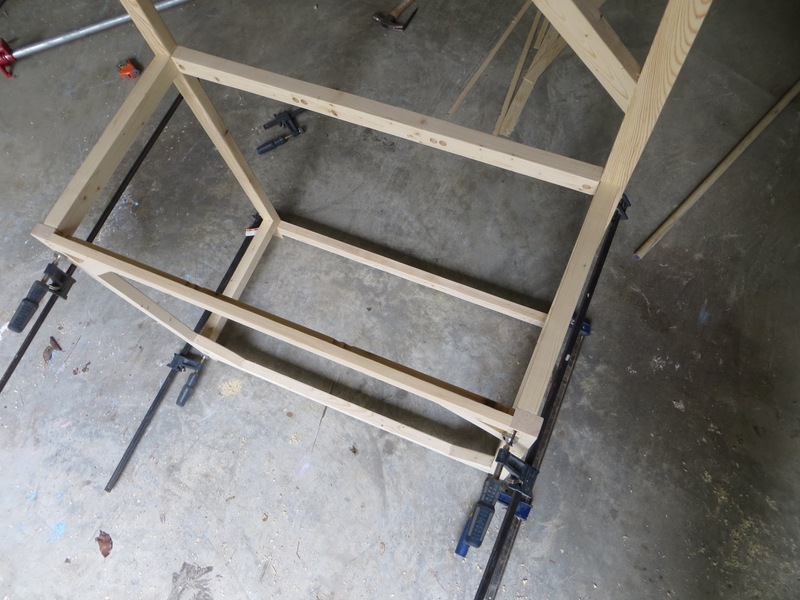 You’ll need to be aware of that groove because you can’t drill holes into dead space – that’s why I had to stagger my holes for the front legs and I decided to stagger them for the rest of the build to keep everything uniform. Ok, so now you have your holes marked for drilling. 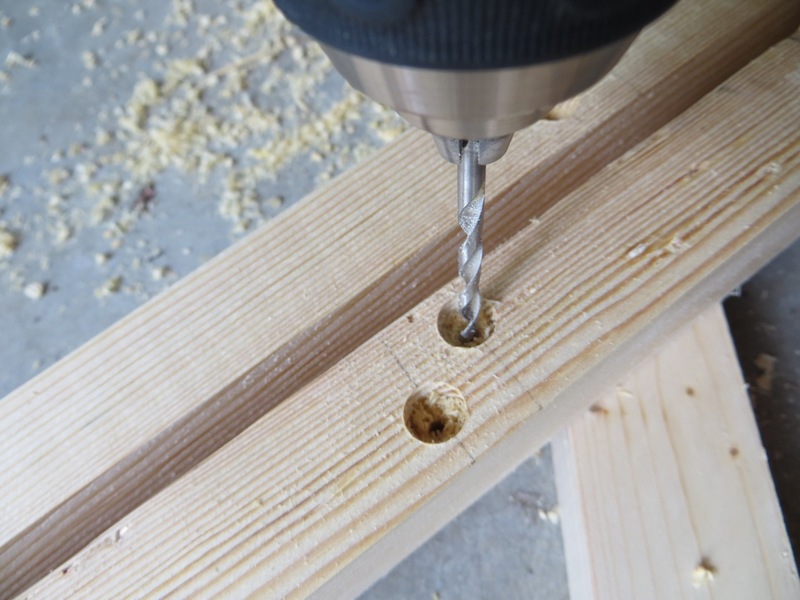 You’ll be using a 3/8″ forsnter bit so you can countersink your screws and plug with your 3/8″ wood plugs. I drilled about 3/8″ down for each one. I also pre-drilled a hole in the center afterwards for my screw. 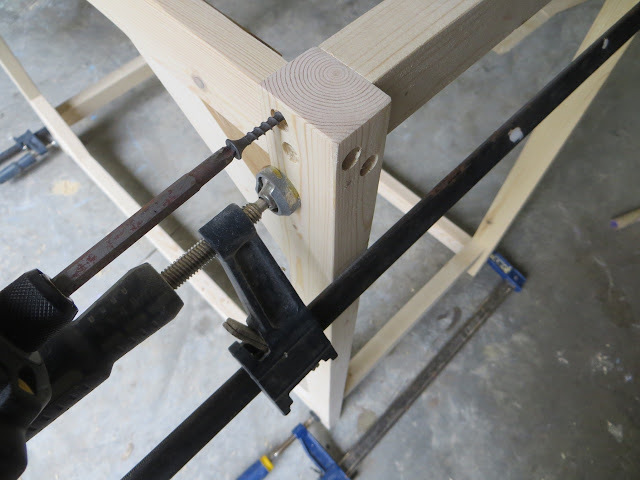 Go ahead and clamp your pieces together and screw in your 2″ screws… using 20 screws all together. Next we’ll work on the decorative x-brace in the back and the corner braces in the front! The corner braces are easy! 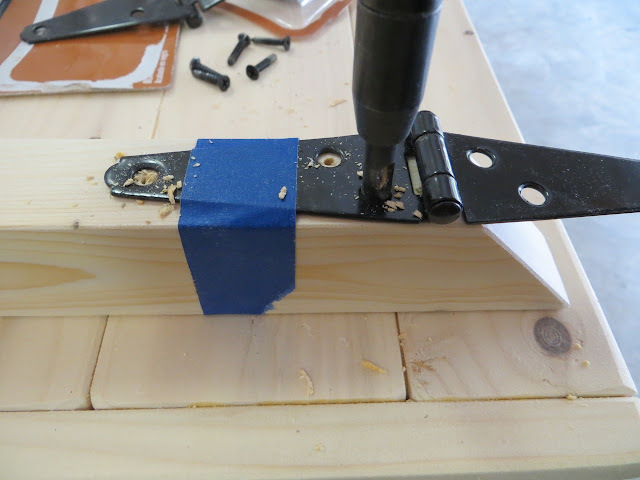 I simply glued the ends and tacked them into place with my brad nailer. Remember you saved these boards to cut for when you could make precise cuts? TIP: Although the x won’t be place where I have it in the photo – it’s easiest to align everything by using the back stretcher as a stopper. Start with the long piece first by cutting a 45-degree angle on one end and placing it in the corner of your stretcher and leg and marking where it lays over on the other leg. I always cut a little bigger than my mark, do a dry fit and determine precisely how much more to take off. You can go back/forth a few times cutting and fitting until you have it just right. For the 2 smaller boards you’ll do the same as you did for the longer board, starting with a 45-degree end and marking where it hits on the longer x-board. 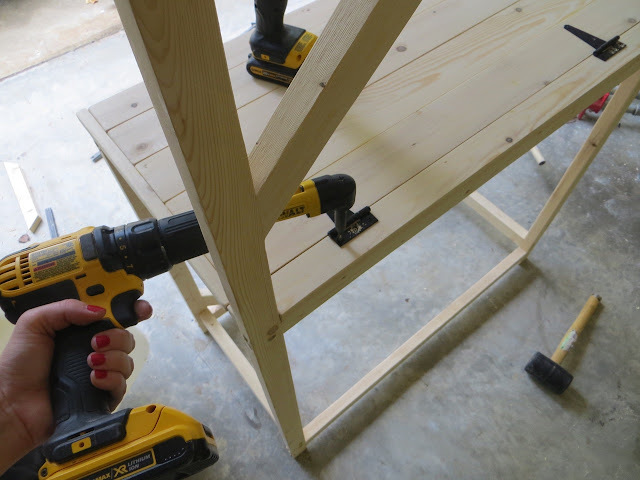 You’ll make a 90-degree cut slightly larger and dry fit before making the final cut. I like to use this same small board section to make my second board to complete the x. See the diagram at the start of this section to see where to place the x – it’s not critical to get it exact as it’s decorative, however, where I placed mine determined where I was going to place the clothes rod braces (so they somewhat lined up). Use glue and a brad nailer to tack boards into place. 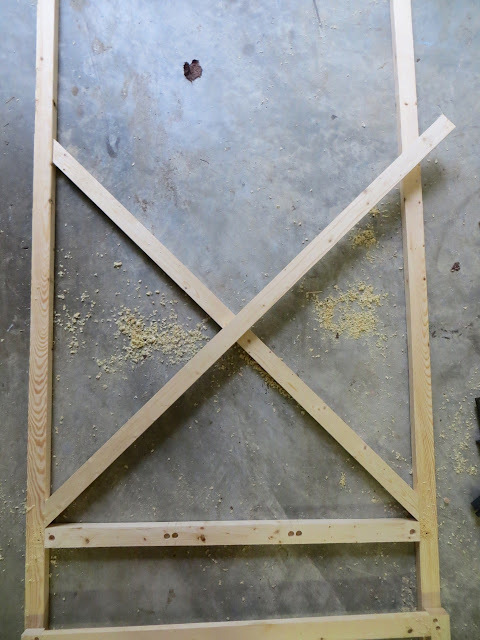 To make it a little sturdier, you can screw the first smaller x board where it meets the larger in the center. 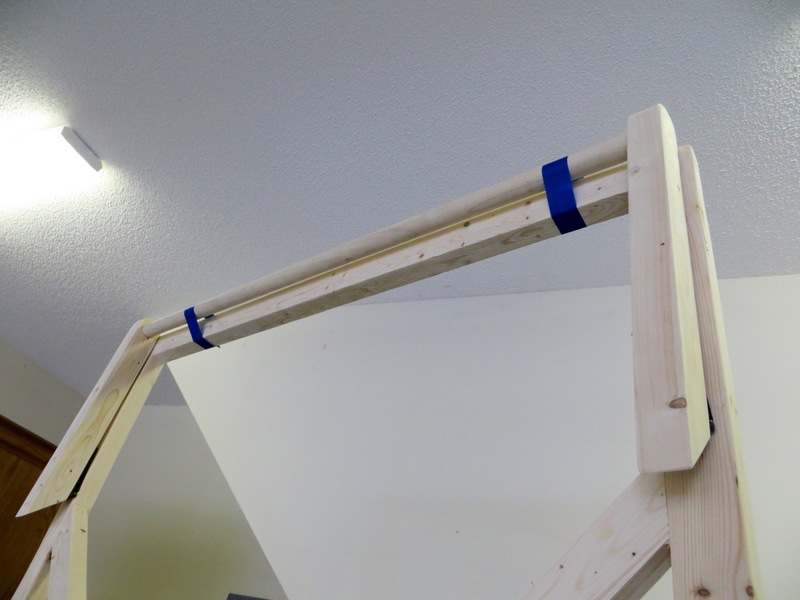 Now we’ll attach the side stretchers! Gather all 4 side pieces. …to figure out screw placement I held my side stretcher up so it was right against the bottom stretcher. The side stretchers will be inset from the hamper edge but flush with the inside of the legs. 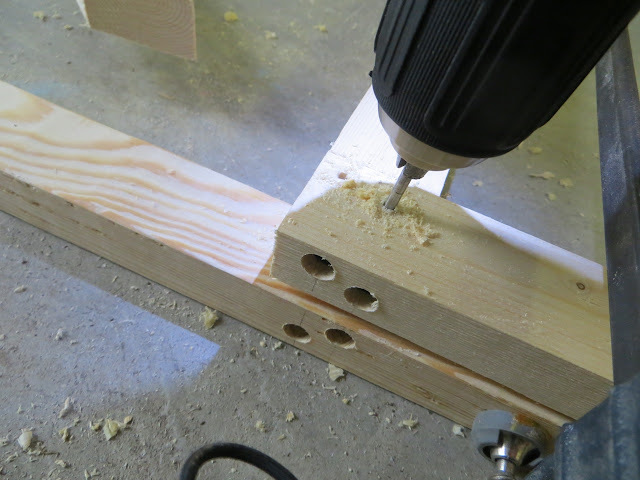 I used my 3/8″ forstner bit just as before and pre-drilled for my 1-1/2″ screws. The top stretchers are a little trickier because there’s screws going through that area already. Rather than doing my forstner bit first I used a regular bit to pre-drill for my screw to make sure I wouldn’t hit the other screws, ha! 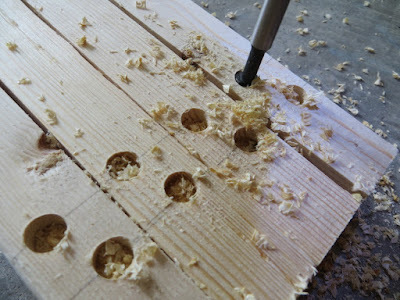 When you’re doing this don’t ‘go in blind’… look at the placement of your screws from the side and judge where to drill. TIP: remember your side stretchers are flush with the inside of your legs and inset from the outside! 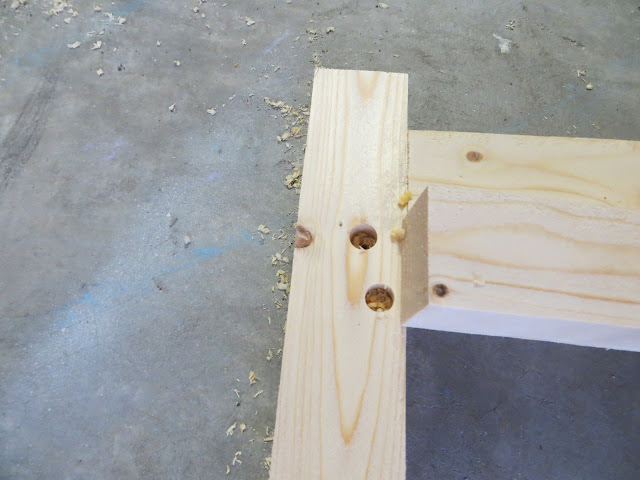 Once I had my screws pre-drilled for I made the holes with my forstner bit. This is the fun part when you can see it all coming together! 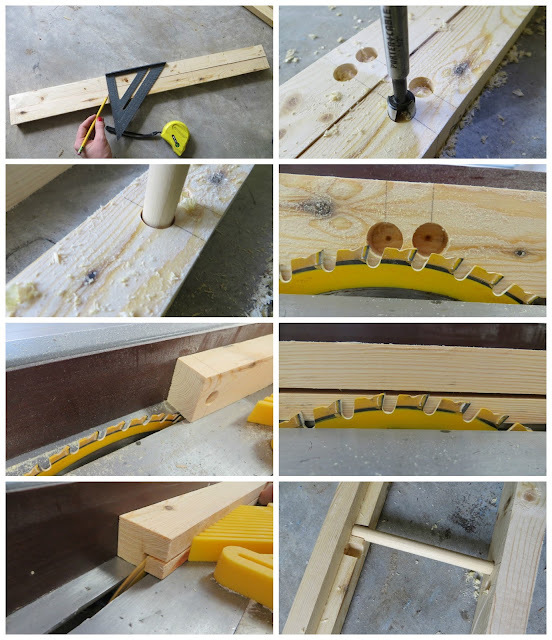 Clamp your side stretchers between your front and back panels (make sure the clamps are as close to where your side stretchers are running but out of the way of drilling). 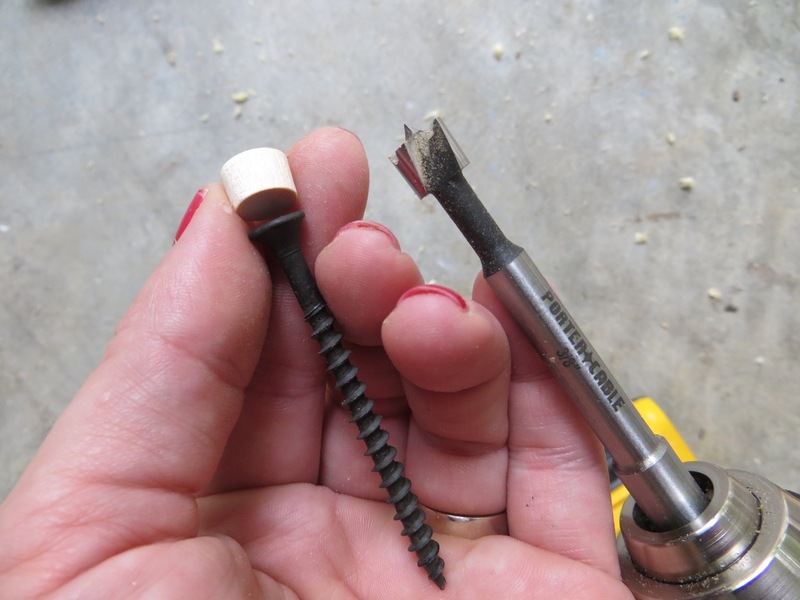 Screw your 1-1/2″ screws into place, using 16 all together. Now for the lid! Gather all your lid pieces (remember we saved cutting the lid end pieces until we could make precise cuts?… we’ll get to that). First we’ll attach the lid back to the hamper. To do this you’ll need to notch out where the back legs are. 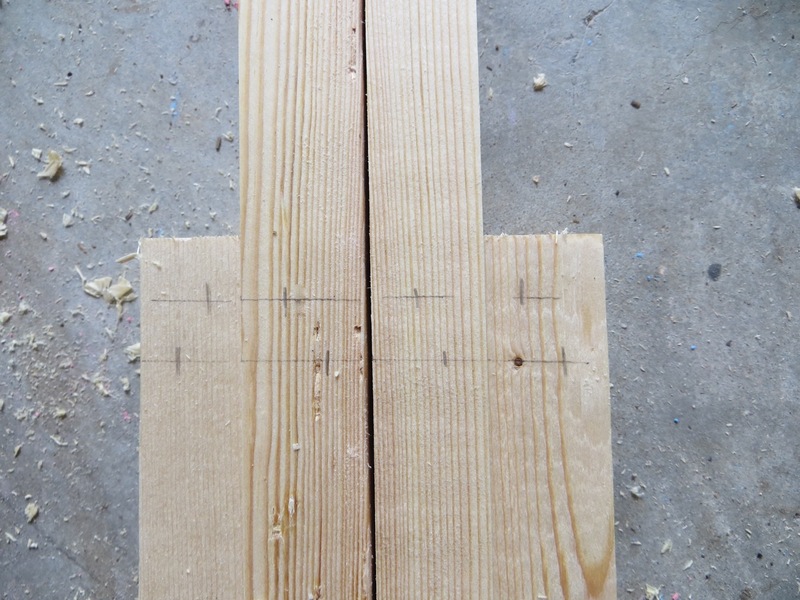 The easiest way is to hold the board up to the legs and mark where to cut. 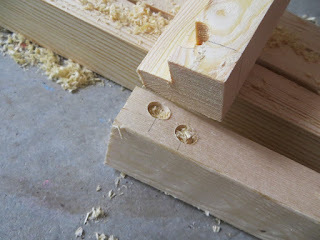 I used my table saw with my miter gauge to cut these so I wouldn’t have to get my jig saw out. Sand with 150 grit. 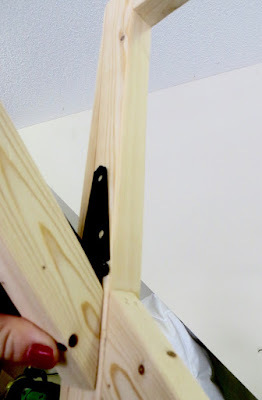 You’ll glue and clamp this piece into place where it touches your back and side stretchers – feel free to tack into place with nails or even screws (I didn’t because my boards had a good connection with the glue). 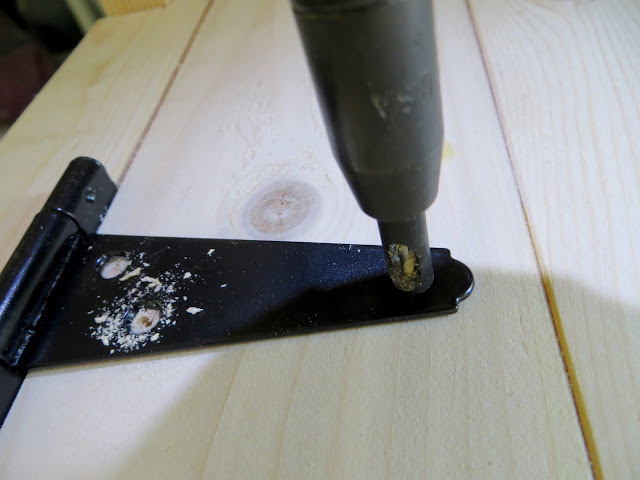 … then I set it up against the board I’m gluing it to and drag it up to smooth the glue out over both surfaces. Clamp your boards together. At this point you’ll want to wipe away any excess glue with a damp cloth. If you are staining make sure you wipe *really* good (remember stain doesn’t take to glue and you’ll get white spots where ever you have glue!). 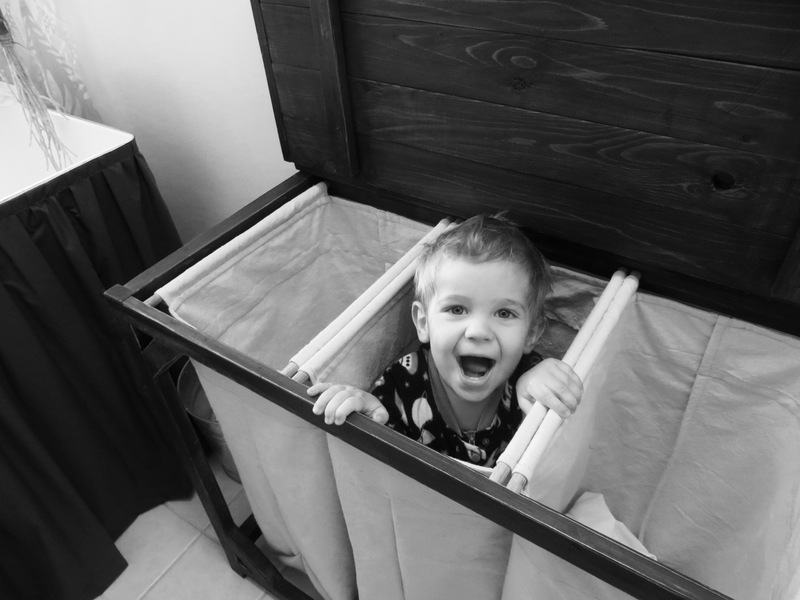 TIP: I actually keep a package of baby wipes in my garage just for this purpose! 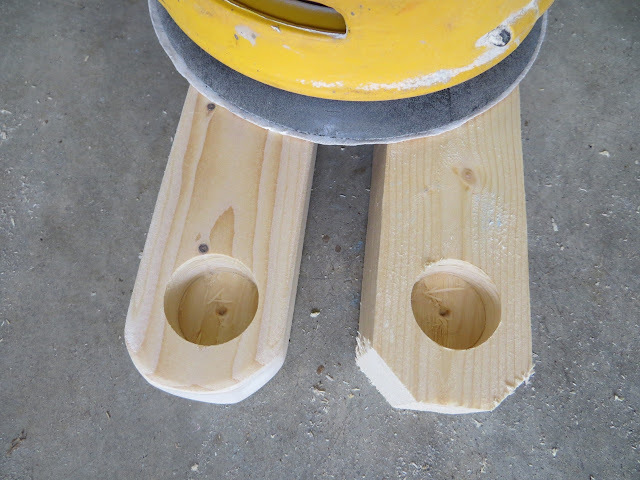 While your top is clamped you can make your end pieces. These end pieces are ripped from your 1×4 board and are about 1/2″ wide (double check to make sure this is the right width to complete your top). 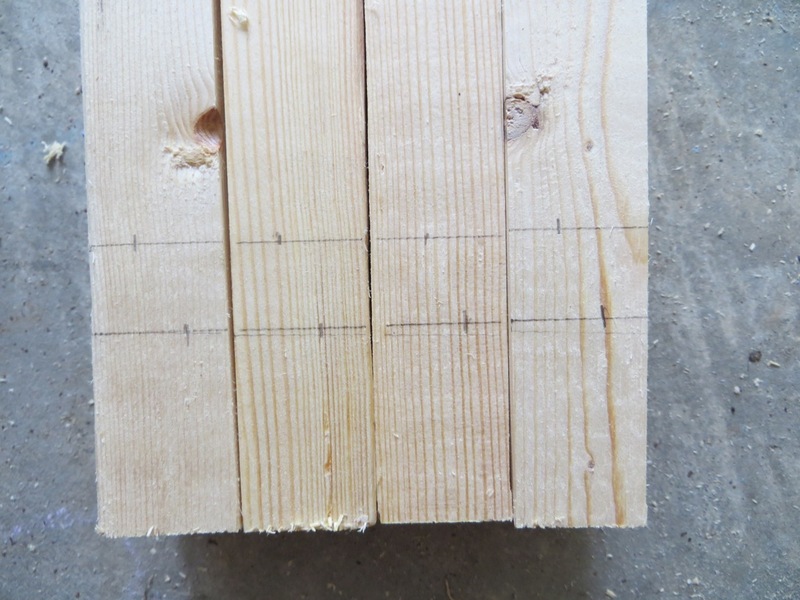 Measure across the width of your 4 boards (mine has 5 but I changed the dimensions to make it easier) and cut your ends to match. I sanded, glued and tacked them into place with a brad nailer. 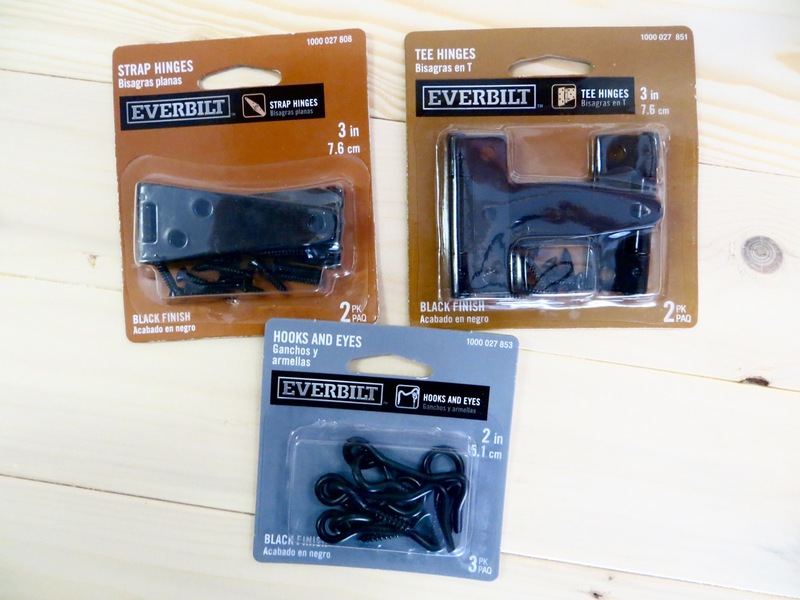 By this point you still have your 2 lid braces left – we’ll get to those later! While the lid is drying glue your plugs in. Let dry and use a hammer + chisel or flush cutting saw to trim away excess. If you don’t have either of those tools you can always sand until smooth! 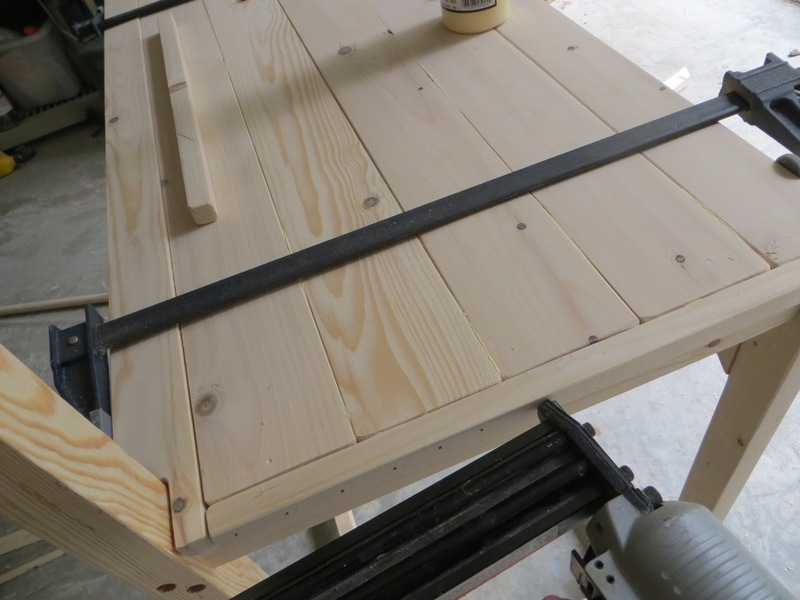 After a few hours your lid should be dry and you can remove the clamps to attach your lid braces with glue and a brad nailer. The placement of these isn’t particularly important as long as they clear the dowels and stretchers when the lid is closed. Now the fun part – hinges! If you don’t have a self-centering drill bit you’ll just need to mark your holes before drilling. If you have a self centering drill bit you’ll be happy! I’ve found that the best way to keep hinges steady and in the right spot while drilling is to fold one end down against the other side of the board; you can see I have the square-end sandwiched between my lid and the board for the back. Decide where you want your hinges and pre-drill holes. Attach screws. Now you can attach the other end of your hinge to the back board. I had to use my right-angle drill attachment for these because the x-brace was in the way. TIP: You can use pennies to keep an even gap between the lid and back board. 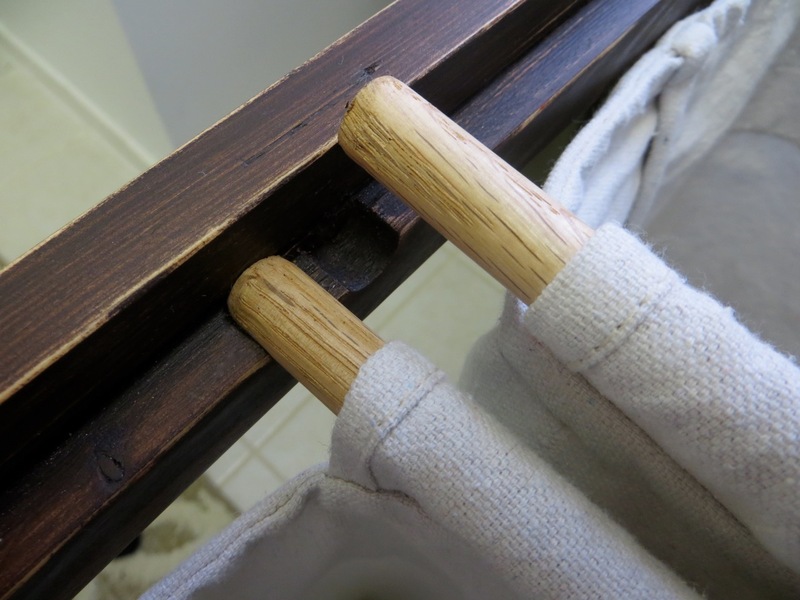 Gather all supplies for making the clothes rod; both clothes rod brace boards, 1″ dowel and strap hinges. You should already have the main 45-degree angle cut on these boards but will need to trim away at the corners to create the rounded shape (also 45-degree cuts but only take off a little). Use a 1″ forstner bit to drill 1/2″-deep holes for your dowel. I measured down from the top of my boards about 2″ to find the center for my hole. 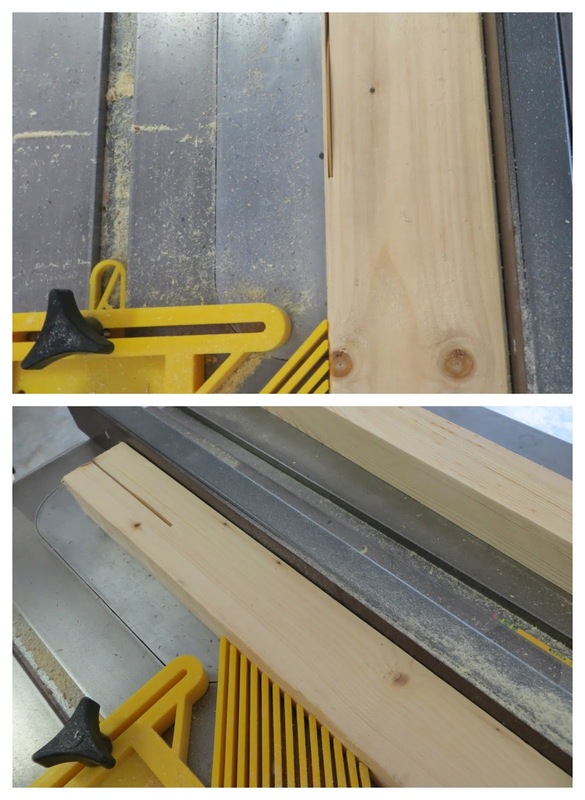 TIP: make sure you’re drilling the holes so your boards are a mirror-image of each other (like first picture above)! 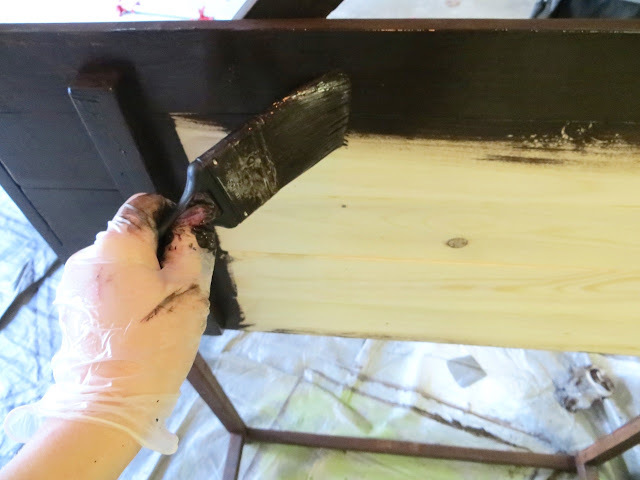 Round-over your corners with the sander (you can see the difference!) and sand boards up to 150 grit. To find the right placement for the hinges I set the board and brace together on a flat surface, made sure the hinge was centered with the board and taped the hinge in place. 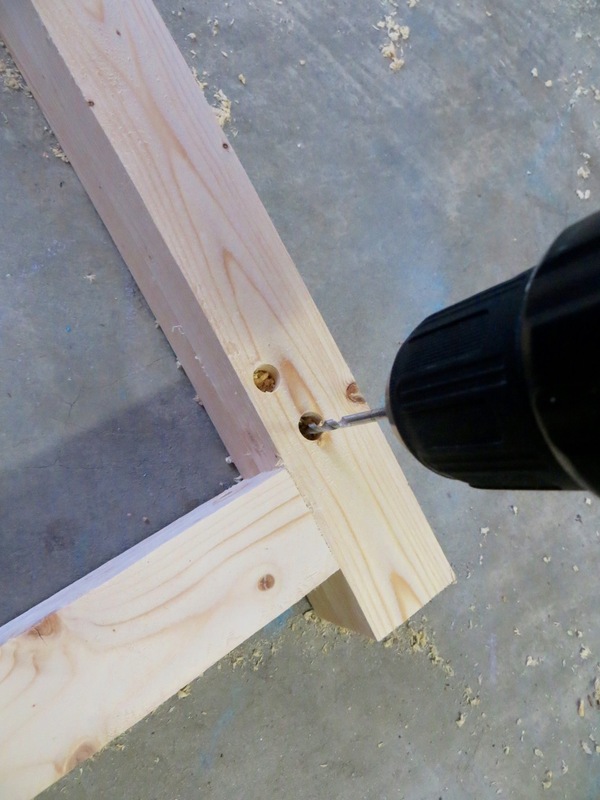 Drill holes for screws (yay for self-centering bits) and attach screws. This next step can be a little awkward. You can always lay the hamper back on the ground to make it easier. I wanted my rod braces to match up with the ‘x-brace’ on the back. 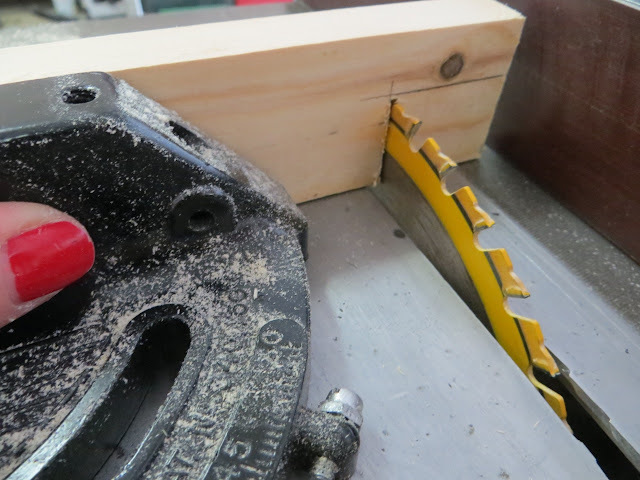 Once in place I marked the holes for my hinges so I could pre-drill holes. 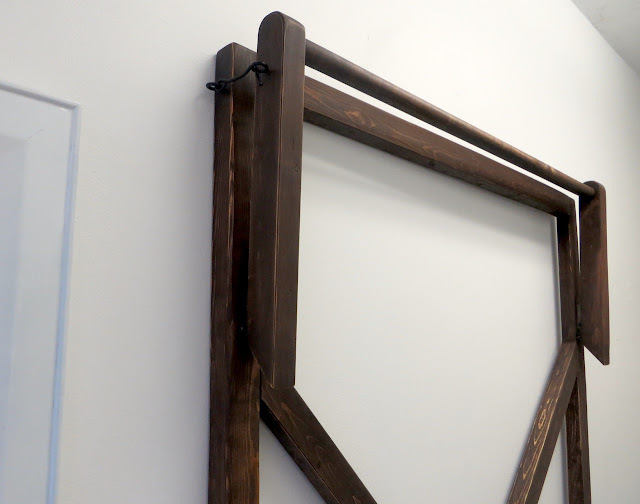 At this point you’ll want to dry fit your dowel into your braces and hold it up to where you made your marks for the hinges. 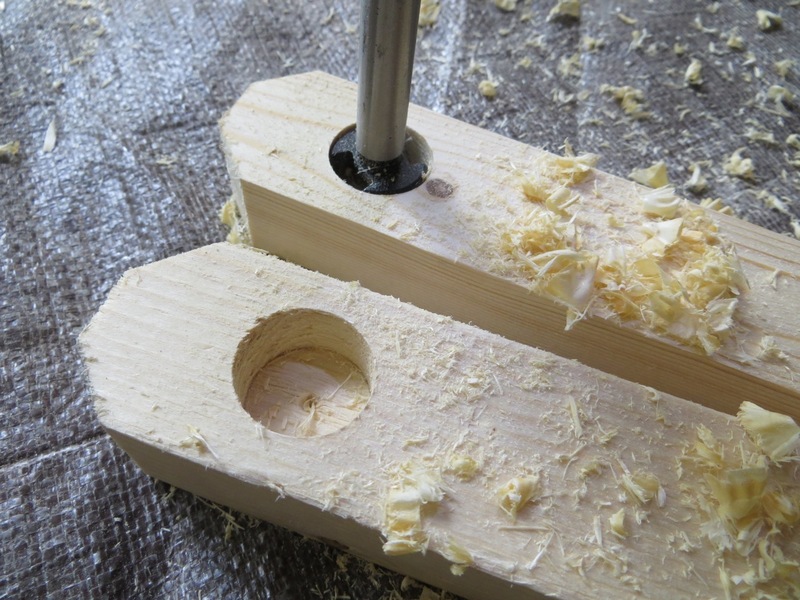 If anything is off you can always cut your dowel smaller to fit the span or drill your holes deeper. If all looks good proceed! 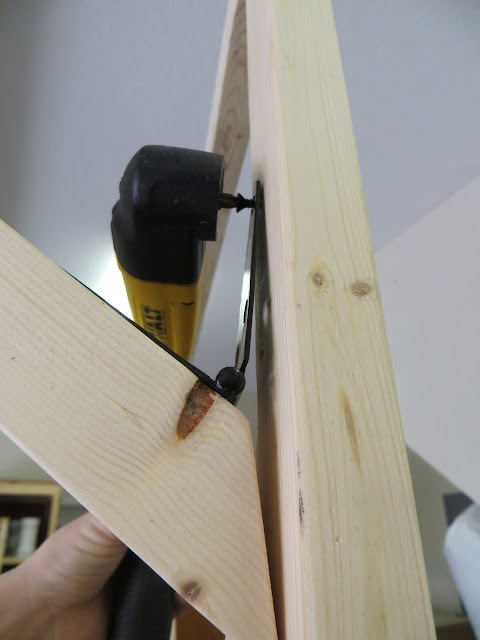 Next I awkwardly attached one of the braces with my right-angle drill attachment (you may need help). 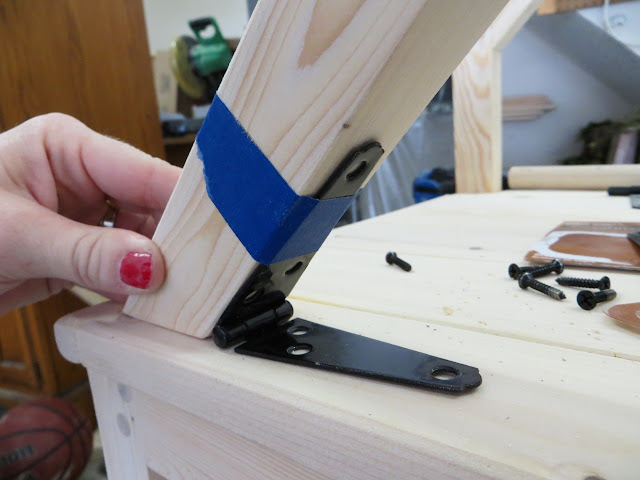 Before attaching your last brace you’ll want to attach your dowel rod first. Butter your rod ends and the holes with glue and screw last brace into place. To ensure the rod dried in the holes normally and not all wonky I taped it to the top brace. 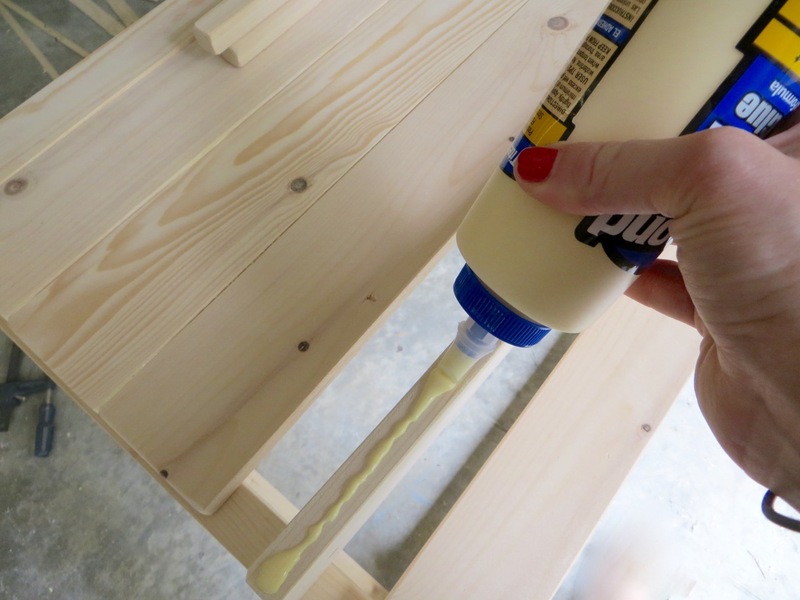 Do a final sanding up to 220 gritt to remove any dried glue, marks or imperfections. Wood fill if you want. 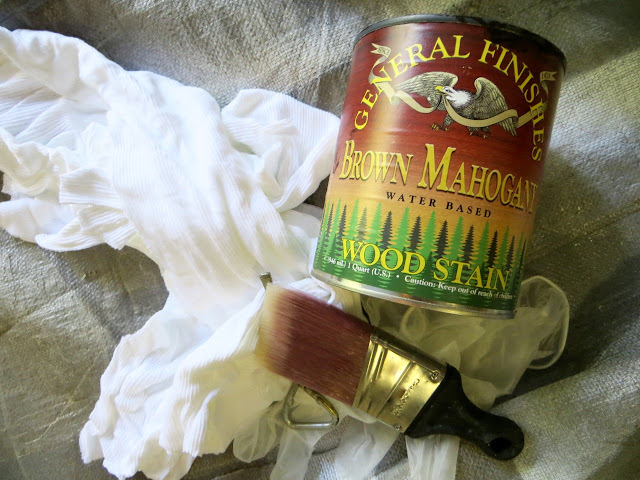 Make sure the hamper is dust free and get ready to paint/stain! After I finished staining I finished off with some Paste Wax which gave it a smooth feel. …pre-drill a hole and screw the hardware on! Whew! – that was a large project! Now onto the sewing part! Ready!? 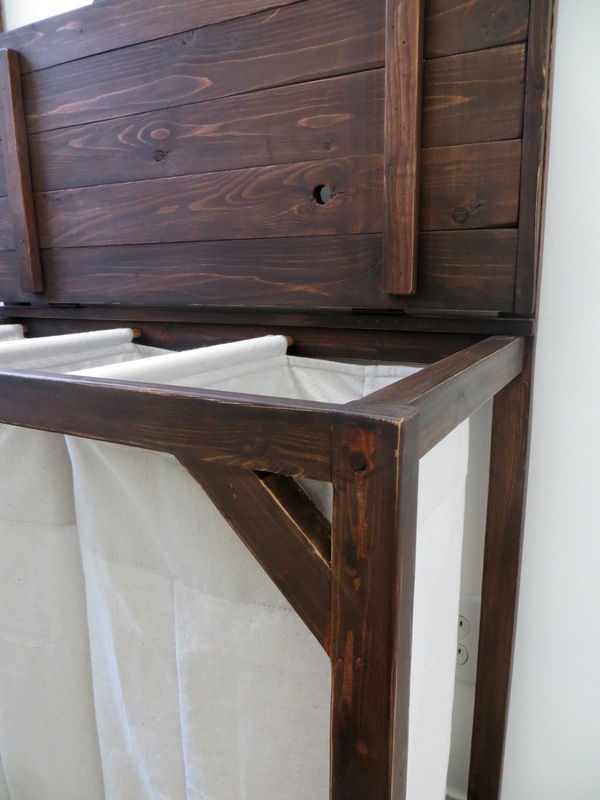 If your hamper was built to specifications these fabric bins will be just the right size – you should have a 9″ spacing between dowels and a 14-1/2″ depth for this bin design. We will be sewing up the sides of your hamper bags while at the same time creating the bottom/triangle pleat. Fold your hamper bin fabric in-half across the length. 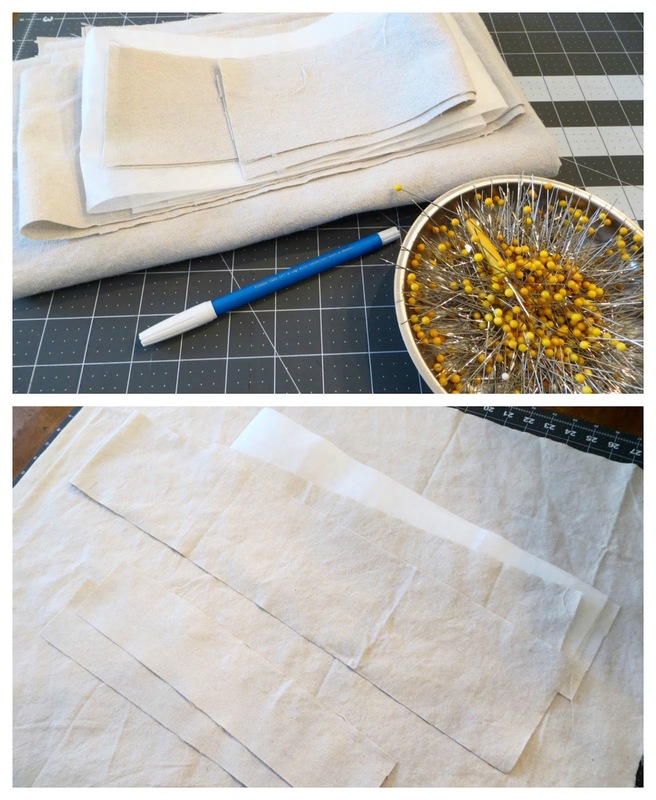 Measure up from the fold (along raw edge) 4-1/2″ and mark both layers of fabric with your fabric marker. 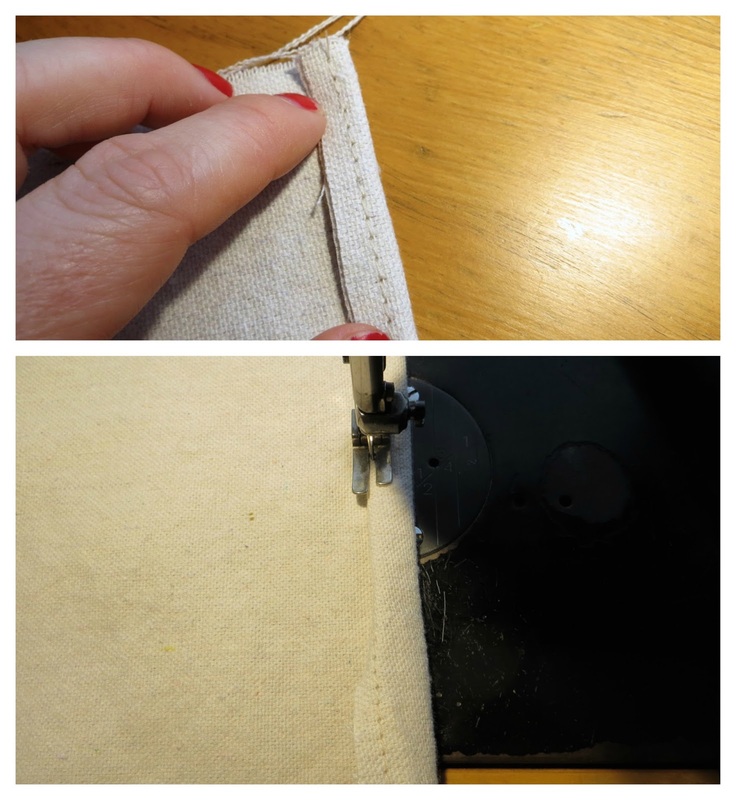 Pinch at the mark and push the main folded edge between both layers of fabric. 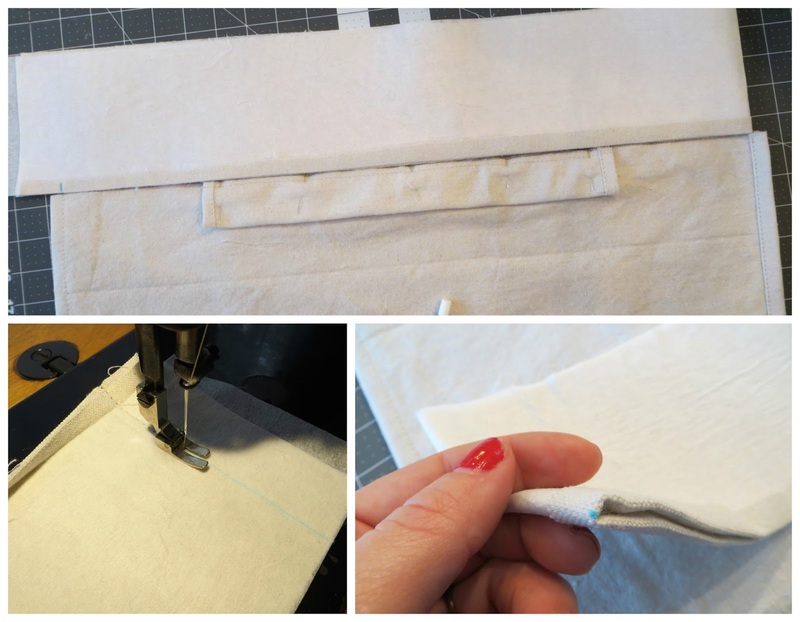 Your marks should be where your new folded edges are along the bottom. Pin along raw edge. Repeat this step for both sides and last 2 hamper bins. Sew along raw edges with a 1/4″ seam. Hem the side seam to tidy it up – folding over close to your first stitch and again. My hem was pretty bulky and was about 1/2″ wide once I was done. 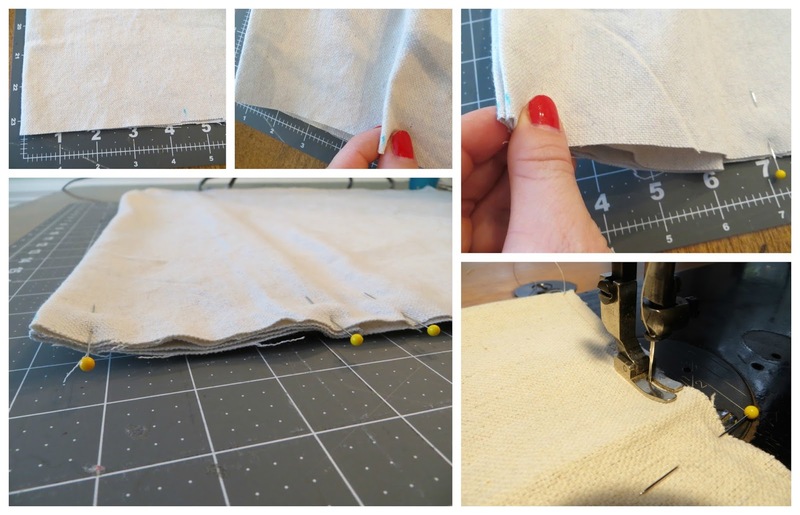 Sew a 1/4″ hem on all short ends of dowel casings. 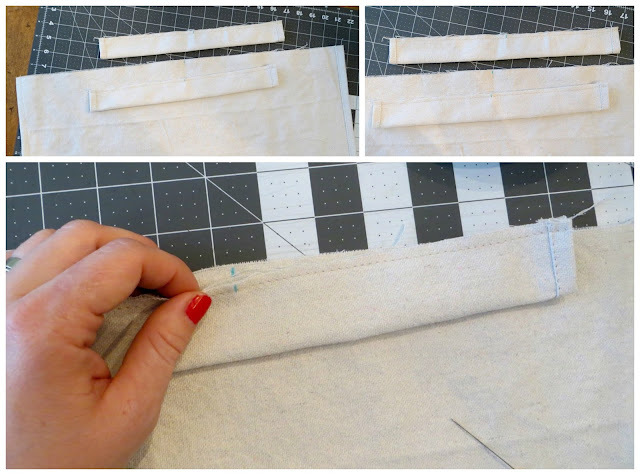 Fold these in-half across the width and baste along raw edge with a 1/4″ seam. 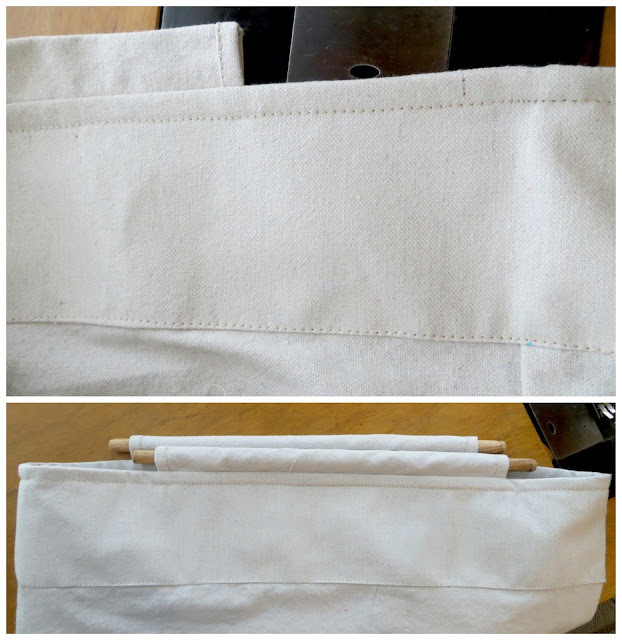 TIP: I chose to have the bulky part of my hem facing out so I could slide the dowels in without them catching. Find the center of the top edge on your bins and the center along the raw edge of your dowel casings by folding them in half and placing a mark. 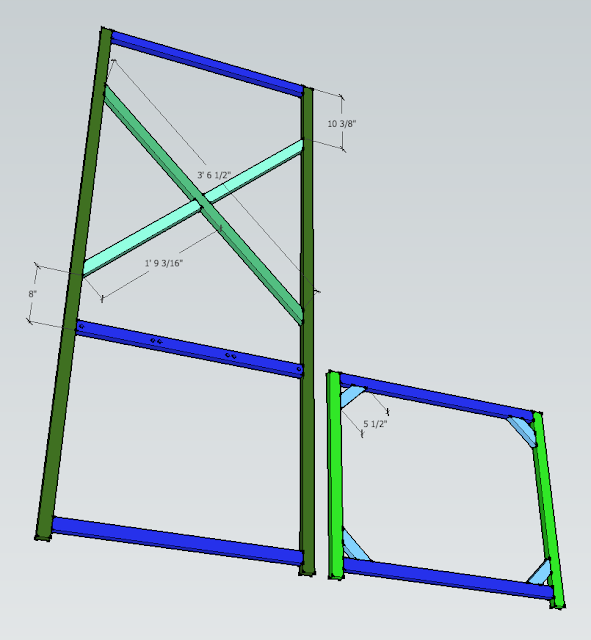 Align and pin casings to wrong side of bins along raw edges with centers even. Repeat for back side and the remaining 2 bins. Prepare the strip panel by ironing the shiny side of fusible interfacing to your fabric. The interfacing is slightly narrower so you can iron one edge of the fabric over and have a crisp line without so much bulk. Repeat for all. 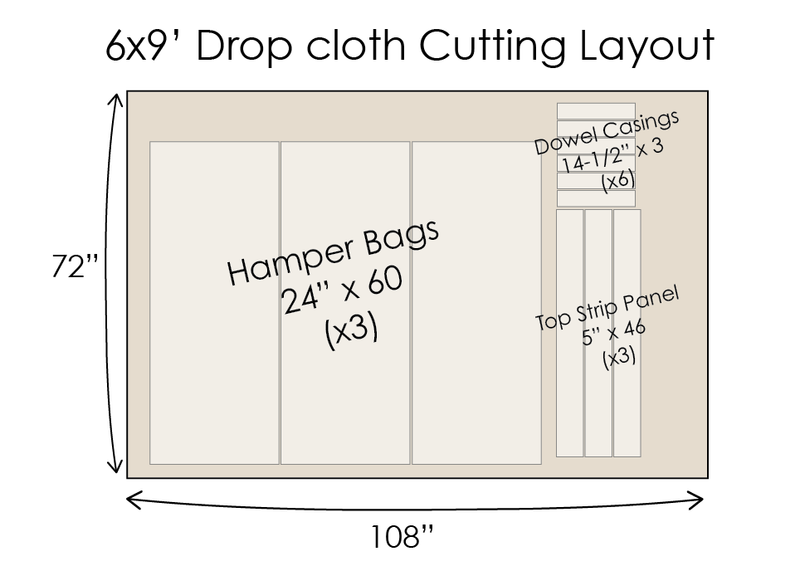 Your strip panel is longer than it needs to be, fold it in half (across length) with right-sides together and hold it up to the top of your bin with the folded edge against the seam of your bin and mark where the raw edges of the strip panel meet the other side seam of your bin… this will give you the perfect size to fit around the perimeter of each bin. 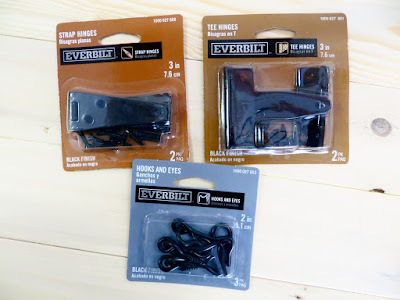 Sew up your mark and trim excess! 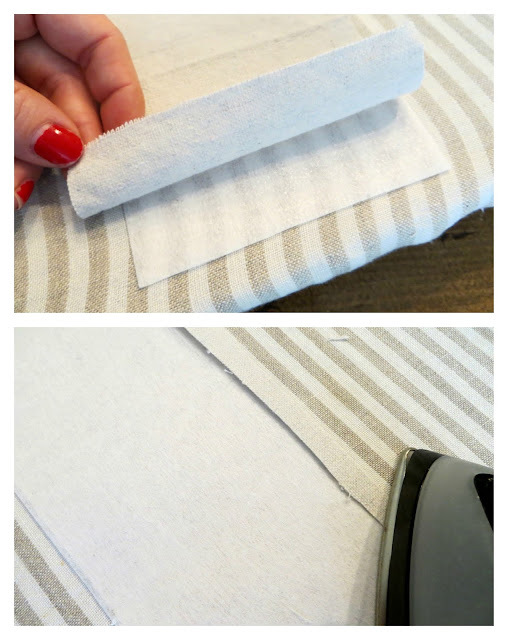 Put a mark on the folded side of your strip panel along the edge that’s folded up. Now you’re going to slip your strip panel over the top of your bin so it’s sandwiching the dowel casings between them. The right side of your strip panel should be against the wrong side of your bin with raw edges even and side seams matching (on strip panel and bin). 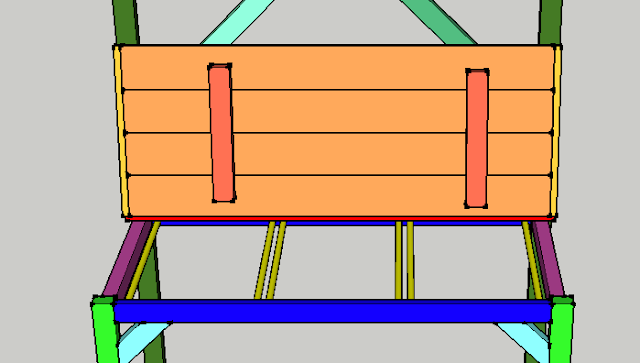 The center-mark for your strip panel should align with the last side seam on bin. Pin in place. 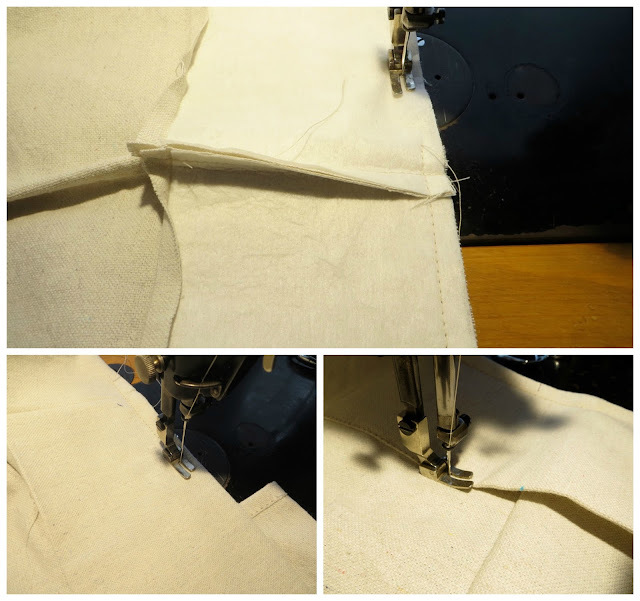 Sew around raw edge of strip panel/bin with a 1/2″ seam. Flip strip panel to the right side of bin and top stitch 1/2″ away from edge. 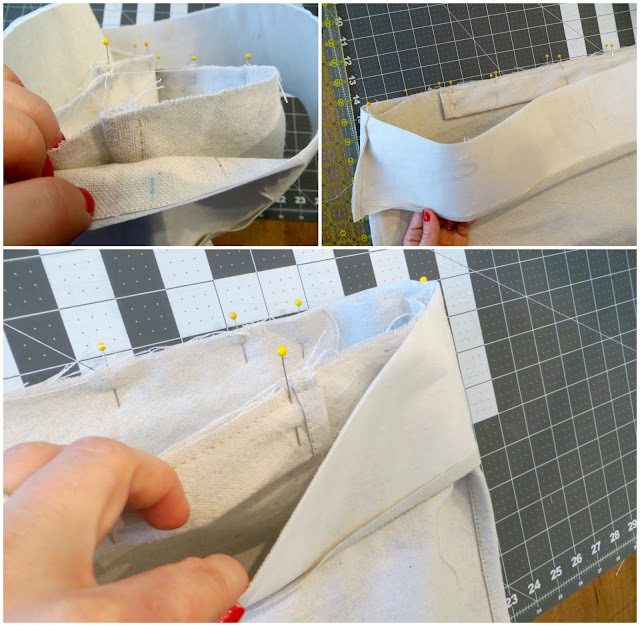 TIP: Roll fabric between your fingers to get the seam out to the very edge. Top-stitch remaining edge of strip panel down to hamper bin about 1/8″ from folded edge. If you want to make your own plant hanger like mine, click here for the tutorial. The sink got a little skirt too (the kids thought that was funny)! It’s attached with stick-on Velcro around the sink. Our new laundry room also needed some artwork! 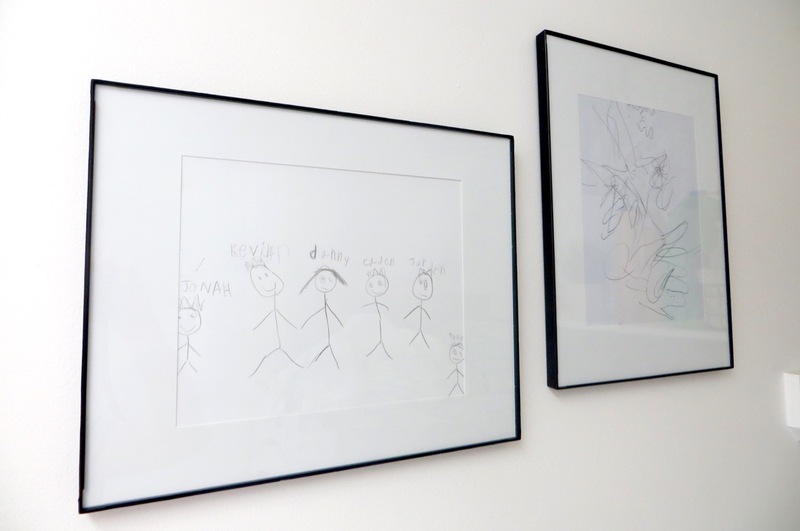 I gave each of the 4 kids their own picture frame to hang up and put whatever picture they wanted inside. 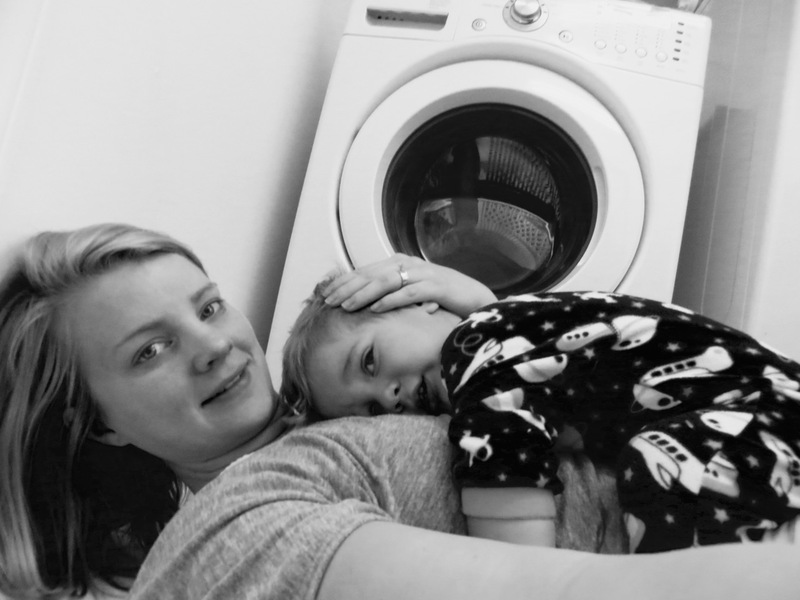 It’s been hard getting anything done with this little rascal – he kept climbing on my back when I was taking pictures for the blog and pretty soon we were snuggling on the laundry room floor. Kids are cute! I'm just curious if anyone else heard those angels when you saw this?! Hahaha this is amazing!!!! Thank you for sharing! This is just what I needed in my laundry room! This is wonderful. 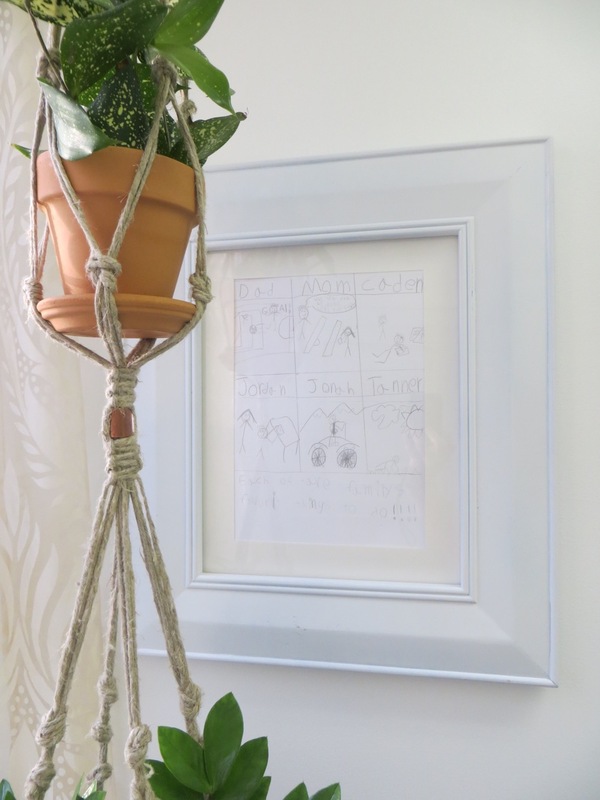 It is definitely on my "to make" list now! Thank you so much for sharing. You're so welcome! Let me know if you have any questions! I loooove this! How have only a few people commented on this hidden gem?? How long did it take to build without the baskets?? Every time I do laundry I think the same thing — it's such a gem! 🙂 I use the clothes rod more than I expected! I estimate it took about 5 hours to build (including final sanding). I'd love to hear how the build went if you decide to do it! Any ideas on how to turn the lid into a intoning surface? 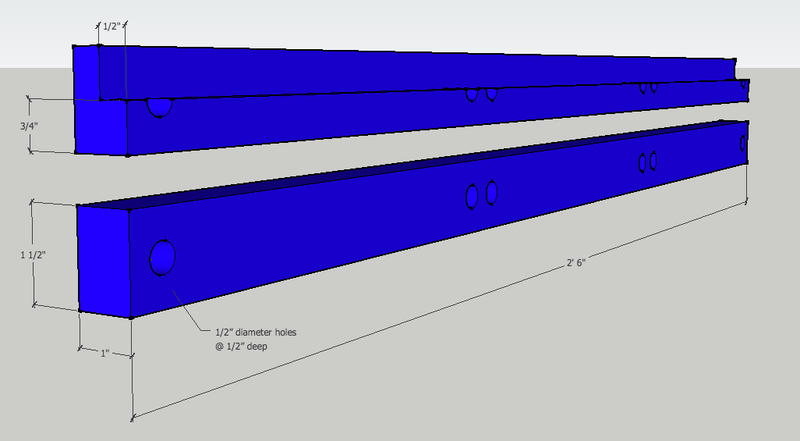 I would want to expand the dimensions a little (adding a 4th bin for my family of 8) and make the top able to be an ironing board. Such a great look! Hey Holly! That’s a great idea, to have the lid as an ironing surface! 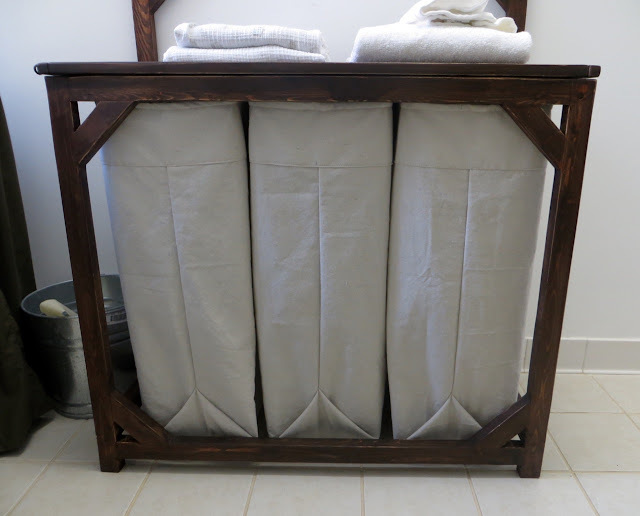 I’d say you could cover the wood with heat resistance foam/material and then cover it with ironing board material (JoAnn’s sells it – it’s shiny quilted fabric). You could staple it down on the underside of the lid. Just make sure you give yourself enough clearance by making the board where the lid hinges off of wide enough. Hi! 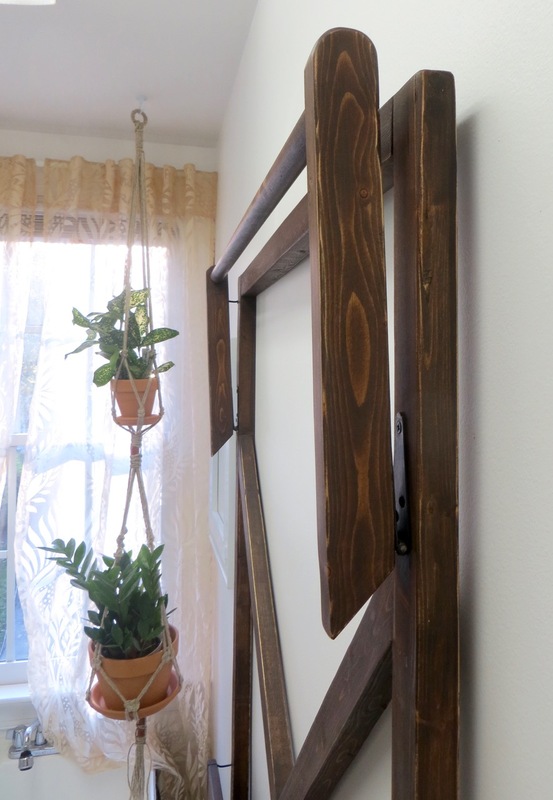 I am not one blessed with sewing skills, just with OCD tendencies and a good working knowledge of wood and power tools and how to combine the two to make really cool things. I don’t actually even have a sewing machine… Do you think I could fabricate these hamper bags using fusible tape? I’ve used the tape you iron to activate in the past with fabric projects but nothing quite this detailed. 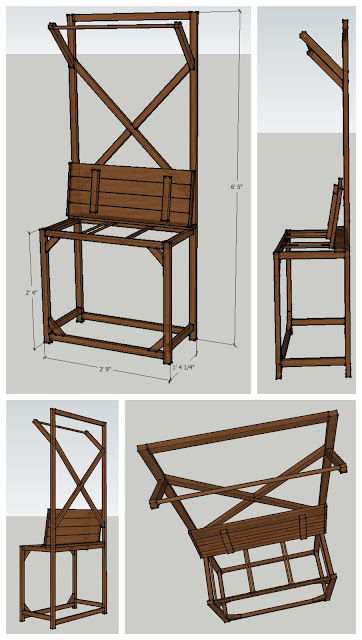 I am planning to make a triple laundry sorter for my bedroom (my boyfriend is a cop and I don’t want his dirty work clothes in with our normal clothes and my laundry room is WAY too small to put anything other than a washer and dryer) and while I am making up my own plans for the actual wood base of it which is totally different than yours, I do like how you did your bags as I haven’t found anywhere to buy anything similar to yours already made. If I could tackle it with the fabric tape instead of sewing I’ll be making this asap lol. Thanks!!! Hi Carson! I totally know what you mean about a man’s clothes, ha! I ho early don’t know about the fusible tape.. is it strong enough to hold the weight of the clothes when it fills up? Best of luck! – I’d love to hear how it goes! Yes, it’s actually drop clothe that you buy in the paint section. There’s different weights – the heavier is going to be more expensive – it just depends how thick you want your bags.